In this tutorial we will see the most critical topic in hibernate, differences between update() vs merge() methods. As we discussed in the previous tutorials, hibernate object has different states that are transient, persistent and detached. Both update() and merge() methods are used to change the state of an object. That means we can call either update() or merge() to transfer an object from detached state to persistent state. A detached state object can be made to persist by reattaching to a session. If the previous session has already been closed, it is also possible to create a new session and can attach to that session. To reattach we can use update() or merge() methods. Both are doing the same functionality, but there are few differences internally. When we call update() method on the session, if that session doesn’t contain the same object (provided in the update()) in the cache then update() method successfully executed and the object been converted detached state to persistent state. When we call update() method on any object, it intern checks, if that object is already existed in session cache or not — if currently updating object is already there in session cache then it throws an exception called NonUniqueObjectException. Otherwise, it will update the object. When we call update() method, if already a session cache containing the same object then the update() method throws an exception called NonUniqueObjectException. On the above example student2 object with Id ‘111’ is already available in session2, if we try to update with the old object (student object) then update() will throw NonUniqueObjectException. Like update() method merge is also used to transfer an object from detached stated to persistent state. 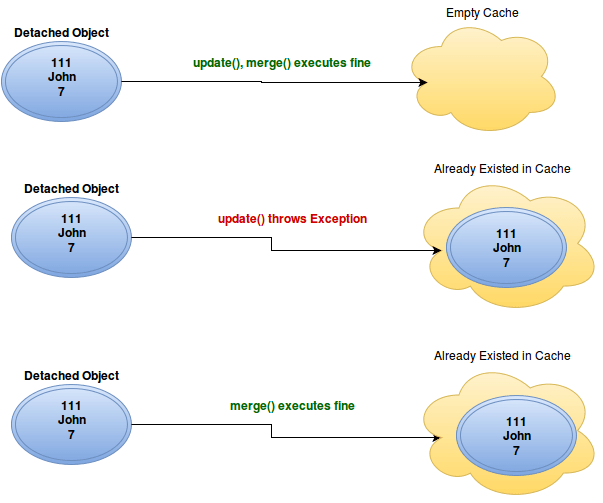 If we call merge() method, then it verifies whether the same object has existed in the session cache or not. If the object has lived in the cache, then the current changes are copied into the cache; otherwise, it will load the values to cache. When we call update() method, if the object already existed in cache update() method will throw an exception whereas merge() method copies the changes into the cache. Best explanation I have ever read.. Very clearly explained the difference. Very detailed and neat explanation. I can able to understand concepts clearly. Thanks for your wonderful explanation. best explanation..it resolve all of my confusion. Hi I have exeuted this code for both update and merge. but in both of the cases record is getting updated? you are updating the same object on different sessions, there is no much difference on this. For more information you can see the difference between load() and get() methods in hibernate.